Ares is a master of a variety of hand-to-hand combat skills and all of the ancient Greek forms armed and unarmed combat. Well versed in military tactics, torture, combat engineering, and Ares is one of the most talented and ruthless soldiers that has ever fought on Earth. 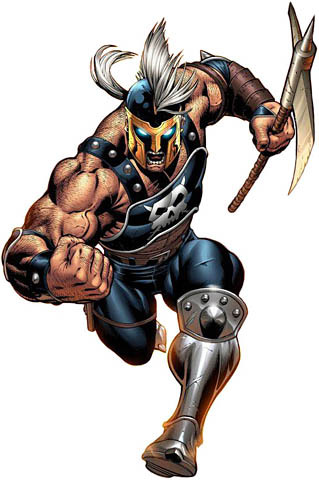 Enhanced Abilities: Ares has upper level super human strength and endurance. Magic Sensory: While not as accomplished at magic as many of his fellow Olympians, Ares can sense the presence of other gods, demons, and the use of magic, call other gods, summon weapons from Olympus, and transport himself by teleportation to Olympus and to Earth at will. Regeneration: Ares is able to regenerate health extremely quickly. Like all Olympians, Ares is functionally immortal. He has not aged since reaching adulthood and is immune to the effects of aging. He is also immune to all known Earthly diseases and infections. Invulnerability: Ares has a high degree of resistance to injury. Weapons: Ares uses a variety of weapons including ancient Greek and Roman javelins, axes, swords, knives, shields, spears, and flails. As well as modern firearms. The son of Zeus and Hera, Ares was worshipped as the god of war in ancient Greece and Rome. Ares dissatisfaction with Zeus' rule of Olympia began after Zeus' decree that worship of the Olympians should be allowed to die out. Ares has three times attempted to conquer Olympus, twice in league with his uncle, Pluto, god of the Olympian underworld, but each time he has been thwarted through the efforts of his half-brother, Hercules, and Hercules' allies. Ares, who hated Hercules ever since he had killed Ares' monstrous Stymphalian birds in the days of ancient Greece, had tried to gain revenge against Hercules.